Morihiro Saito Sensei was born on March 31, 1928 in a small village near the Iwama dojo. He began his Aikido training when he was eighteen years old. He had practiced Kendo as well as Shito-ryu Karate and Judo. 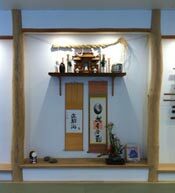 Saito Sensei was accepted by Ueshiba O-Sensei as a student, and this was the beginning of a very long and close relationship. Due to his 24-hour on and 24-hour off working shift with the Japanese National Railroad, Saito Sensei had a lot of time for training at the Ueshiba dojo. Early morning classes were devoted to prayer at the Aiki Shrine followed by weapons practice. This was the period when The Founder was deeply engrossed in the study of Aiki-Ken and Aiki-Jo and their relationship to empty-handed techniques. Not only was Saito Sensei a diligent student, but he also helped The Founder in his daily life and took part in caring for the rice fields and other farming tasks. The founder was clearly impressed with the dedication shown by Saito Sensei. O-Sensei gave Saito Sensei a plot of land on his property and this is where Saito Sensei then built his house and lived with his wife and children side by side with the founder. 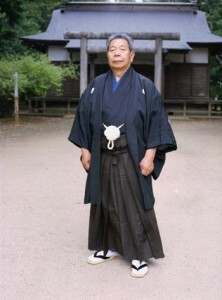 By the late 1950s, Saito Sensei had become one of the top instructors in the Aikikai system. He taught at the Iwama dojo when The Founder was out travelling. Saito Sensei also instructed on a weekly basis at the Hombu Dojo (International Headquarters Dojo in Tokyo) in the 1960s, teaching Aiki-Ken and Aiki-Jo for the last fifteen minutes of each Sunday morning class.